I love popcorn. Just ask my family, who has the same affliction as I do. Nothing, I mean nothing, can satisfy a craving better than hot popped corn in a big bowl and then gulping it down, handfuls at a time. It started innocently enough. When we were young my parents would pile us kids into the back seat of the car along with big bags of popped popcorn, and away we’d go to the drive in movie theatre. We were happy there, three kids in the back seat watching movie after movie, eating our popcorn and gulping our pop (a treat for those nights). It couldn’t get any better than that. When we got older, there was Saturday Hockey Night in Canada and while watching the game, there we’d all be with big bowls of hot buttery popcorn and cheering on our team – it was family night, it was hockey and popcorn. 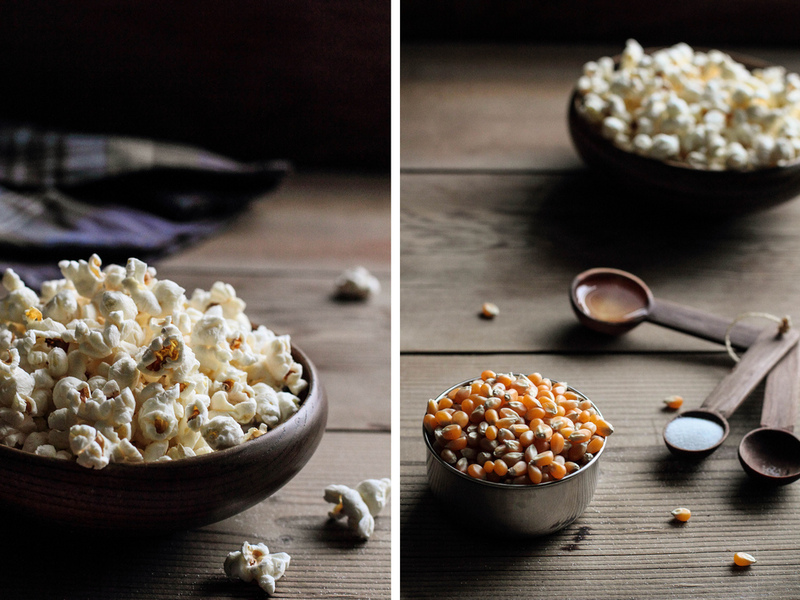 So I’m sharing what I think to be the best way to make popcorn. Popping kernels on the stove top might not be new, but it might be new to those who grew up with the microwave popcorn. Sure, I made the microwave popcorn for more years than I care to admit to. But I finally remembered how my parents made it, and rediscovered the stove top method. This is amazingly the best. The wonderful smell, the sound of the kernels in the pan, the spattering of oil … hmm. For the purist moments, I leave it plain. Other times I might lather it with seasoning, add some sugar in the pot for a kettle version or drizzle it with delicious honey butter. I’ve discovered recipes that are so good, that when you drizzle white melted chocolate and add some sprinkles, it takes on a whole new world of flavour and taste. Who knew chocolate and popcorn could work together! Since rediscovering this way of making popcorn, I’ve vowed to never go back to the microwave stuff again. This version is easy, takes only 3 ingredients, I can make as much as I like, costs me pennies and if that’s not enough to entice you, the smell alone will drive you crazy! In a large 8-quart pot, melt the coconut oil over medium-high heat. Add 3-4 popcorn kernels, cover, and continue heating until they have popped. This is how you know the oil is hot enough to begin the popping process. Add the rest of the popcorn kernels, cover, and remove from heat. Swirl the pot around to evenly distribute the oil around the kernels. During this wait period, all of the popcorn kernels reach the same temperature, which allows them to pop at more or less the same time. In approximately 30 seconds, return the pot to the heat. Cover to avoid spattering oil, but keep the lid slightly askew to allow the steam to escape; this will result in crisper popcorn. Soon after, the kernels should begin popping. Every so often, completely cover the pot and shake it lightly to prevent the kernels from burning. In 2-3 minutes, the popcorn should be completely popped. Immediately transfer to a serving bowl. Sprinkle on the salt, toss, and serve hot. *Any oil with a high smoking point will do, such as peanut, grapeseed, or vegetable oil. Use whatever you have in the cupboard. No, I haven’t made this delicious looking dessert yet, but chocolate and espresso go together perfectly that when I do make it, it will be the grande finale in a wonderful meal. Time isn’t always on my side so I experiment with new recipes on the weekend so that I have a Plan B backup if it ends not being eaten (or worse yet, tossed to the garbage). I know it’s really bad when even the dogs don’t eat the creation! This dessert finds itself on a long list of recipes in my binder that are waiting to be enjoyed if I can only get to making it. I know all of you likely have the same kind of list, go ahead and admit it and you’re drooling right now! So maybe you have more time than I do, you have all the ingredients on hand and have the creative mindset to make this right now. So here’s the recipe for you to try when you can get to it, and hope it’s a wonderful choice that you end up calling it a “keeper.” Enjoy! 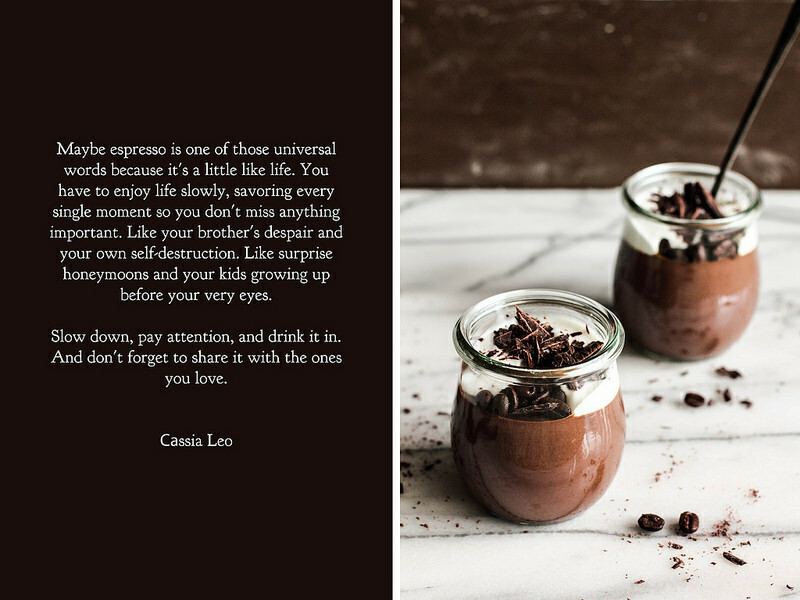 Chocolate Espresso Custard is a sweet, cool treat to enjoy any time of the year. While this version is dairy-free, utilizing coconut milk and coconut whipped cream, there are substitutions to make it a bit more traditional. The smooth flavors of chocolate and espresso are both pronounced. 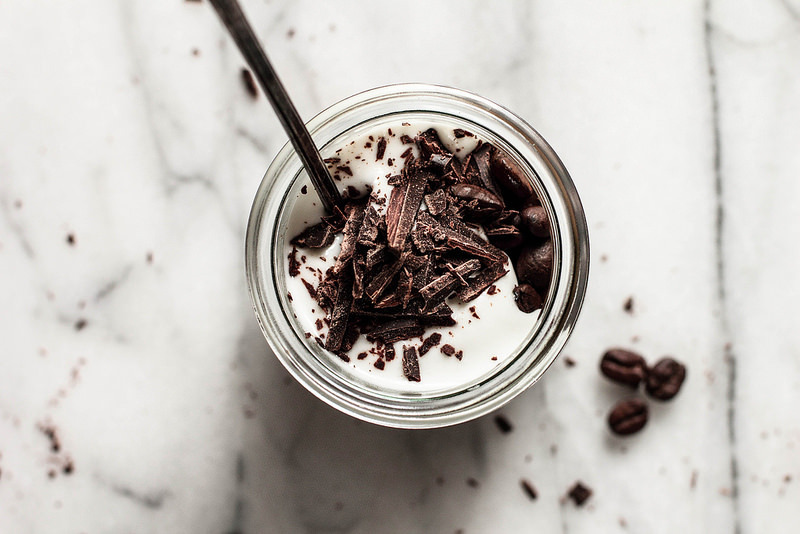 When garnished with whipped cream, chocolate shavings, and chocolate covered espresso beans, this custard will disappear in no time. It must be the time of year or I’m just taken with all the great blogs and recipes available at a whim, but here I am again with another great recipe. Well, this isn’t just a recipe but a chilled coffee recipe, and I love it because I love coffee hot or cold. Without question, it’s pure art when you can make great coffee, and it’s a better art when you can find good coffee in a strange place. You know what I mean. You’re out and about, shopping, strolling, shopping and then bam! it hits you and you suddenly get that craving for some good coffee. Well, where’s the best place in town? Where do the locals go? And while I personally have nothing against Tim Hortons (and all their fans) I don’t drink their coffee. Period. Where’s all this going? 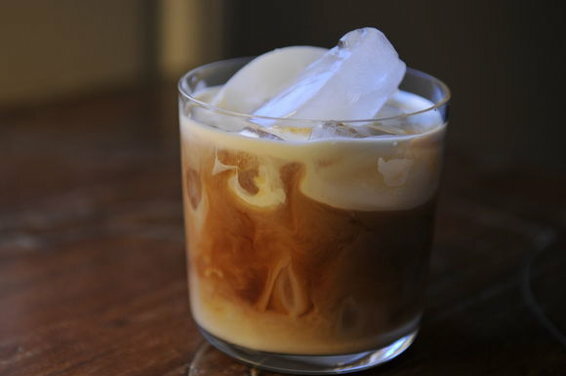 Well I found this terrific recipe for chilled coffee that I really enjoy. Mix the ingredients together, strain and then keep it in the fridge ready for when you have a quiet moment to savour it, or keep it on the ready when you have company. It’s adaptable so you can change it up any way you like by maybe adding spices like cinnamon or dribble in some Bailey’s or Vanilla Infused Vodka if you so desire (yummy). It’s a great patio sipper on those hot summer days, but believe me when I say it’s always good no matter when you serve it up! I made this new chicken recipe tonight along with some wild rice and steamed broccoli and I have to say it was good! I discovered it awhile back on one of my favourite blogs and after promising myself a day to make it, today was the day. I don’t know about you but having no backup “Plan B Menu” for those times you experiment with a new recipe can be a bit daunting, especially when it’s late and everyone is getting hungry. So to say the least, I was happy it turned out on the first try and even happier that it tasted great! It’s now part of my official list of go-to recipes and I’ll even change things up a bit next time (they say all good cooks do that!). *Note: if you like extra sauce, double the sauce ingredients – pour half over the chicken and follow the baking directions in the recipe and pour the other half in a small saucepan. 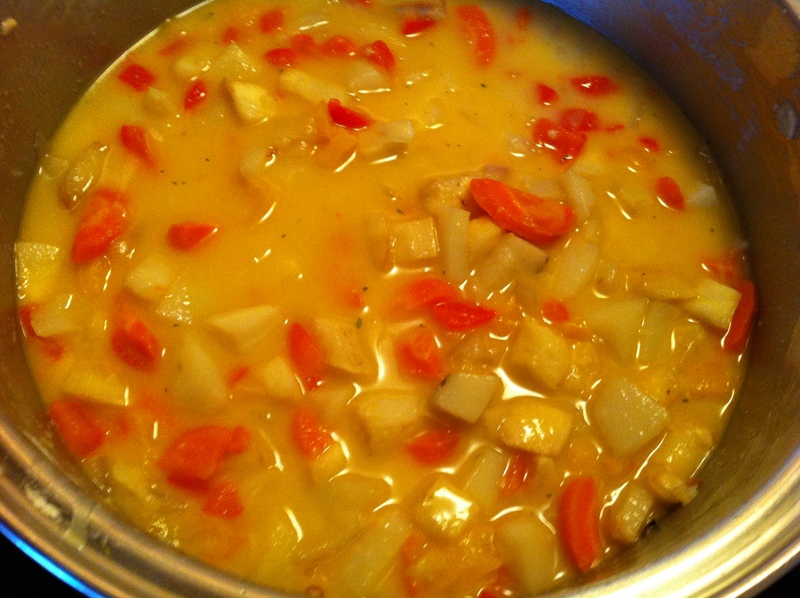 Cook the sauce on the stovetop at a simmer for 8-10 minutes until it reduces and thickens. Serve it on the side of the chicken. For the chicken, cut boneless chicken breasts into chunks. Season with salt and pepper. Dip chicken in cornstarch and then in egg. Fry in a little oil until brown but not cooked through. 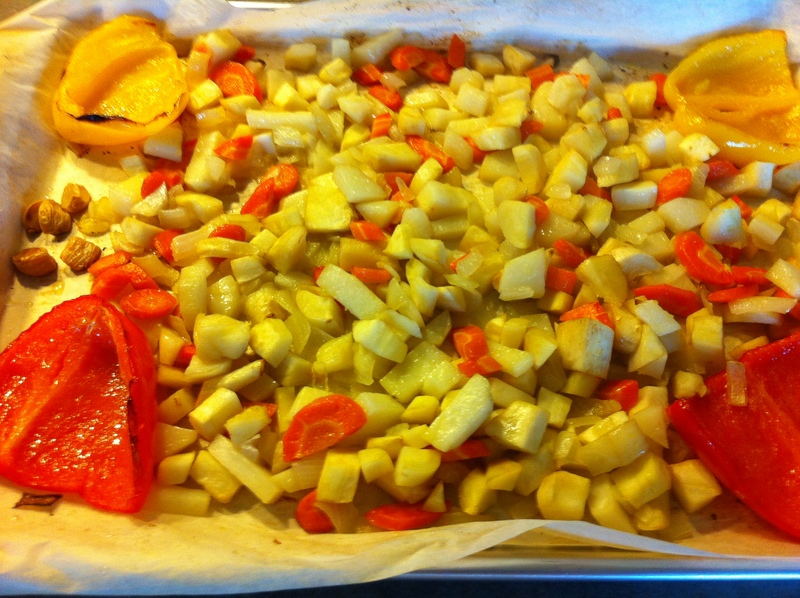 Place in a single layer in a baking dish. Mix sauce ingredients together and pour over chicken. Bake for one hour at 325 degrees. 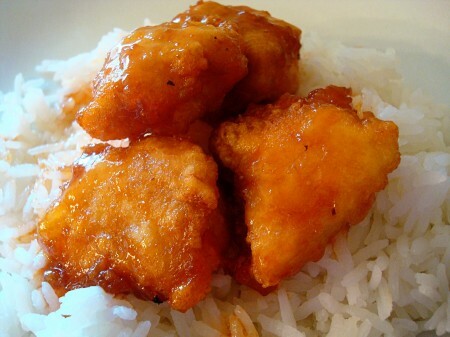 Turn chicken every 15 minutes so it is evenly coated with the sauce. Serve over rice. Be sure and visit Mel’s Kitchencafe Blog for other great recipes and tips! 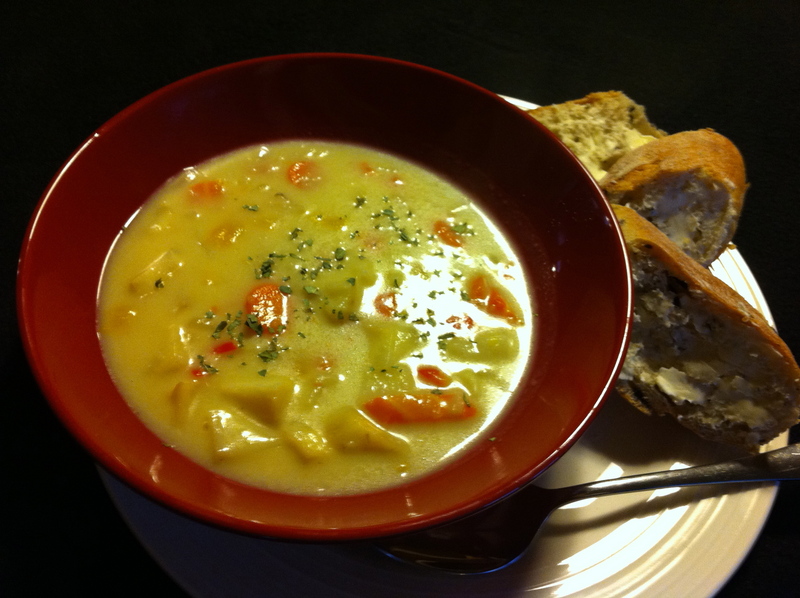 There’s nothing better than a delicious meal bounded by homemade soup. Sipping contentedly on my morning java and waiting for the last of the morning daylight to appear, I pulled out my recipe binder for inspiration for the dinner meal and decided to make one of our favourite soups, “Cream of Roasted Vegetable”. This soup has never us down – it always comes out creamy, gives a wonderful hint of wine and great flavours of roasted parsnip, potato, onion, pepper and carrot. This was going to be good! With dew still lying on the morning grass, I put my clogs on and made my way back to the veggie garden. Let’s see, I need parsnips, check. Onions, check. Carrots, check. Digging them up and scrubbing the dirt off, into the bucket they go and back to the house I go to start cleaning and chopping these beauties. Chop into bite-sized chunks and roast for about 45 minutes. Did I tell you I love roasted veggies? It’s something about all the earth smells coming together, blended into a heavenly scent that puts each of your senses on high alert. 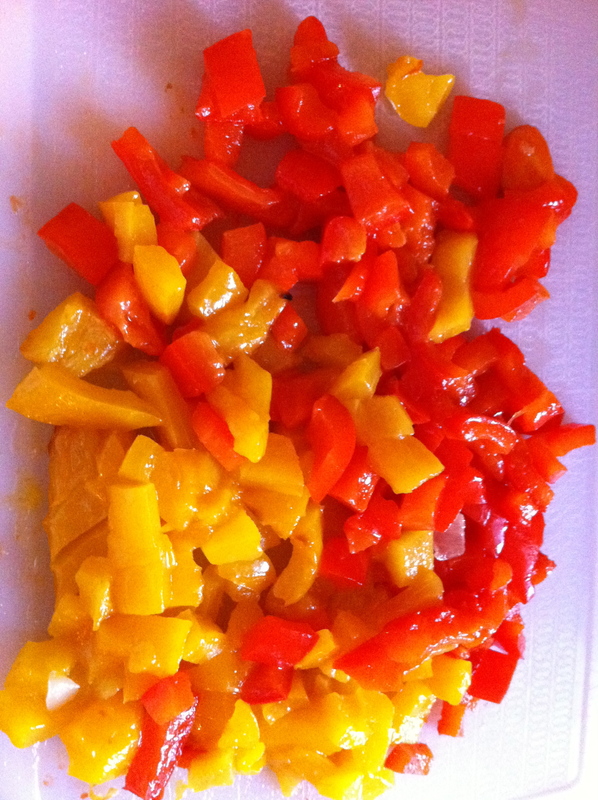 The aroma, the colours, the textures…. it can’t get any better than this. Then comes the magical part of all this…..
Oh how I love to bake because nothing beats “homemade”. I don’t always have time to cook or bake what I want to, and if I have to admit it out loud, Klem is a better cook than I. But I digress. 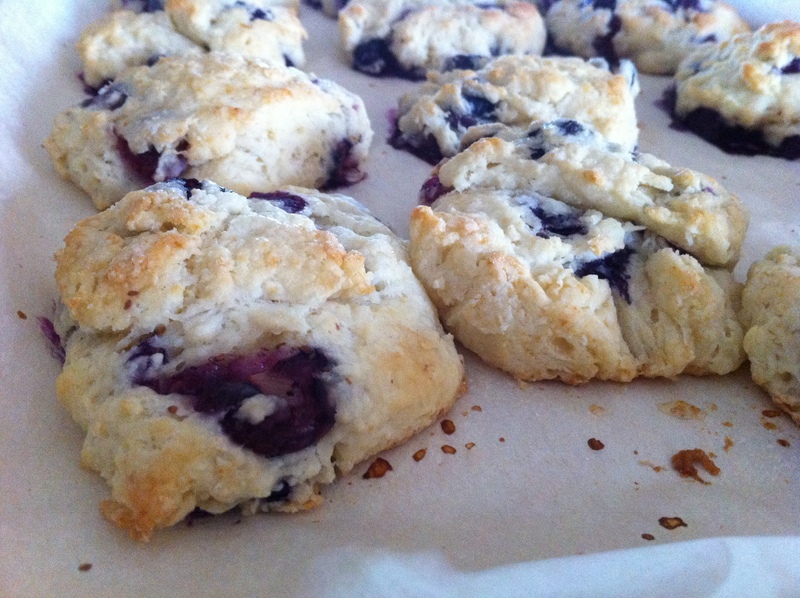 So Sunday morning came and I knew what my soul, and everyone else needed…a batch of fresh blue berry scones. Grabbed my recipe, whipped up the dough, added those fresh melt in your mouth fresh berries and put the scones on the pan for baking. Off they go into the oven for about 20 minutes. Got the coffee and grinder (did I tell you I love the smell of freshly ground coffee too?) and made a big pot of hot, steaming coffee.